* ❤ Khaori Sato オフィシャルブログ ❤ *: Review: Drugstore foundations. Recently, I am collecting different kind of drugstore foundations that many beauty blogger and YouTube guru's using, so I read and watch some of their reviews about it and I am wiling to try them out. So here's my DRUGSTORE FOUNDATIONS. And here's the swatch for each foundation.. So here are the review of each foundations..
Covergirl & Olay Simply Ageless Foundation: This foundation comes in a round compact with a sponge applicator under the main foundation compartment. It is swirled with color and white Olay serum that is supposed to hydrate, de-age, and make mature skin look younger. When choosing a shade, remember that the actual shade will be lighter than what you see in the compact. When the color is swirled together with the white Olay stuff, it become much lighter. Okay, now my opinion for this product. I have a dry skin, sensitive, and acne prone skin. I like the SPF22, the Olay serum that is supposed to improve your skin, the smoothness on the skin when I applied it. However, this product is super matte and dull. So, you can see your face cakey after a few hours wearing this foundation. So I recommend for those having dry skin to use just a small amount or else your face will be very cakey. Maybe this foundation works better for oily skin than dry ones. Loreal Magic Smooth Souffle: This foundation was just released recently and I ordered this online and their product is authentic from US. This foundation comes in a pretty cute glass container jar. This one can compared to Maybelline dream matte mousse. This product has a truly air whipped consistency to it. It applies very smoothly onto the skin and is easy to blend. However, If you have spots or acne scars like me, I recommend use concealer. 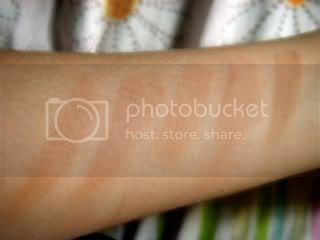 Because this foundation is very light and doesn't cover spots and scars that much. And if you also have dry skin like me moisturize first your skin well because this foundation is super matte. You don't want your face to look drier. This foundation is better for oily skins. Revlon Photoready: This foundation is comes in a little glass container/bottle with pump in it. Many beauty bloggers and YouTube gurus said that it is comparable to Makeup forever HD foundation but way too far cheaper! I love this foundation because it gives you a flawless look on your face and this foundation claims to be oil-free and fragrance free with SPF20. This foundation works on dry skin like me and for those who has oily skin too but this foundation gives you a dewy finish so those with oily skin should probably refrain. The thing some people dont like about this foundation is that it has a shimmer on it. So who those dont like foundation that has shimmers this one is not for you. But for me, the shimmer really dont show up on my face so I really like this foundation. Revlon Colorstay (Normal/Dry Skin): This foundation is comes in a little glass conainer/bottle without pump. If other people dont like the Revlon photoready, they may love this Revlon colorstay. I love this foundation because like what other people say, it can last all day long and also gives you medium to full coverage with SPF15. The only thing that I dont like about this foundation is that it has no PUMP. Thats why its kinda mess and you waste some amount of it. But so far, it's a great foundation for everyone who has dry skin. For those who have oily skin you must buy the combination/oily ones. 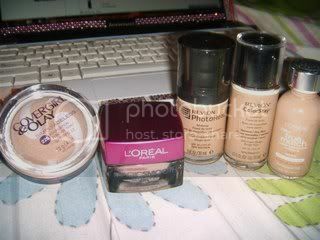 Loreal True Match Super-Blendable Makeup: This foundation comes in little cute glass bottle without pump. This one has wide range of colors that you can choose from cool-warm tone. I like this foundation because like what the foundation says its super blendable and can gives you a dewy and fresh face look. When applying this you only needs small amount to get medium to full coverage. Unfortunately like the Revlon colorstay it has no PUMP, so the bottle will force you to pour out a boatload if you're not careful. But so far this foundation works really well. I am not a PROFESSIONAL Beauty guru or blogger. Im just sharing my opinions for each product that I mentioned above. I hope this review can help you to choose your right foundation.